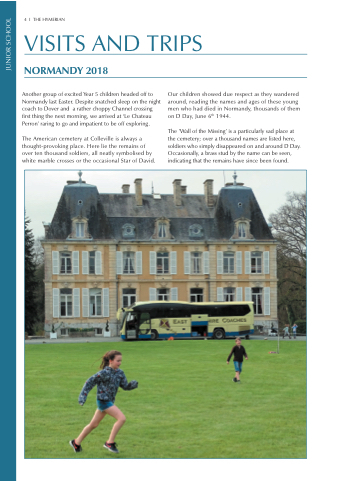 Another group of excited Year 5 children headed off to Normandy last Easter. Despite snatched sleep on the night coach to Dover and a rather choppy Channel crossing first thing the next morning, we arrived at ‘Le Chateau Perron’ raring to go and impatient to be off exploring. The American cemetery at Colleville is always a thought-provoking place. Here lie the remains of over ten thousand soldiers, all neatly symbolised by white marble crosses or the occasional Star of David. Our children showed due respect as they wandered around, reading the names and ages of these young men who had died in Normandy, thousands of them on D Day, June 6th 1944. The ’Wall of the Missing’ is a particularly sad place at the cemetery; over a thousand names are listed here, soldiers who simply disappeared on and around D Day. Occasionally, a brass stud by the name can be seen, indicating that the remains have since been found.